One Seed, One Community aims to strengthen our community by providing a shared experience that teaches people how to grow nutritious food and save seeds.The One Seed, One Community Project is based on "one book, one city" or "community read" programs. Instead of uniting a community in reading a single book, we find common ground by growing the same seed. Many home gardens are usually too small to grow the minimum plant numbers to maintain the genetic stock of many seed varieties. Choosing one seed for many gardeners to grow and save builds a greater diversity into the genetics of that variety, as we share those seeds with one another through the vehicle of our seed libraries. Over time, this process has the potential to build local adaptation in these seeds and strengthen our local food systems. When you give seed packets out, explain that you will send a few emails out throughout the growing season walking them through the planting, harvesting, and seed saving. At the end of the season, you'll also want to give information about how they can share the seeds with friends and neighbors, donate them to the seed library, as well as participate in a Great Bean (Pea) Weigh Out Party, where you come together and weigh how much you grew and share stories, seeds, and food. There tends to be more satisfaction in saving these larger seeds for some people. Perhaps it's size or a tactile factor. Many bean seeds are gorgeous and can hook folks into seed saving! Although tomato seeds are easy to save, the plants are not as easy to grow. Tomatoes, a subtropical plant, often have to be started indoors on heat mats in many regions. Gorgeous bean: There is something exciting about opening a dried pod and beautiful beans are inside. Selecting an eye-popping bean when dried will inspire both kids and adults alike! Snap bean or dual purpose bean: Most folks are not going to grow soup or dried beans in quantities that are sufficient to make a meal out of. As a result, they may be discouraged to save seeds again and are less likely to share the seeds that they did save. Finding a bean that is eaten in the green stage is better for the purposes of engaging people in saving and sharing seeds. You may also find a bean that can used as a snap and soup bean. Once again, most folks are not going to have the quantity to make soup from their dried beans, but they'll have the satisfaction of harvesting some of their green beans, saving some of their seeds, and having an increased appreciation for the amount of time and land required to make soup beans. Bush beans: Although offering either a bush or pole beans is fine. Bush beans will not require extra materials (poles) for novice gardeners. However, the downside is that the yield will be less. Maybe you can start with a bush bean, and then the following year, once you and your community have built some capacity, you can start offering pole beans. Unusual characteristic: The peas in the pod are not going to be eye-catching. See if you can find a pea that has some unusual characteristic, ex Golden Sweet Pea (yellow podded), Sugar Magnolia (purple podded), or an attractive bi-colored flower. Sugar snap, snow or dual purpose: It takes a lot of shelling peas to make a dish and the same is true for soup peas. We recommend starting with a sugar snap pea. Snow peas may not have as much appeal as a sugar snap, but they are the next best option. You may also be able to find a pea that is dual purpose, such as one that can be grown as a snap or shelling pea. Talk with local farmers several months in advance to see what they are offering. See if they have any interesting things they are selling. Perhaps, you can work something out for the following year, if this year doesn't work. Look at regional seed companies or larger seed conservancy projects that sell seeds, such as Seed Savers Exchange and Native Seed/SEARCH in the USA. WARNING: You do NOT want to get seeds from the supermarket to sell or from out of the country. There is a bean mosaic virus so you want to make sure you get your seed from a reputable grower who is selling beans for growing. NOTE: Many small growers cannot afford to pay for the organic certification, but use good farming practices. Additionally, it is better to buy something that is conventionally grown, but unusual, and preserve that than it is to pick a commonly available variety. Three different colored packets with different quantities of seeds. You can get a rough estimate of how many peas or beans are in a pound/kilo from many professional growers. You can have all packets contain the same amount of seeds, 20 is a good number, or you can have different sized packets. The Grow a Row size was inspired by the Grow a Row campaign to provide food access to food insecure members or our community. Here is a calculation template that you can make a copy of to see how many packets you want to make and how many pounds or kilos you need to purchase. 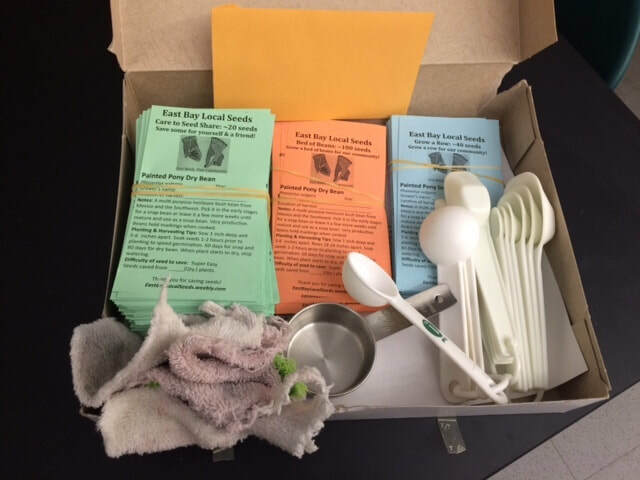 Here is an example of what East Bay Local Seeds did for our first One Seed, One Community program, and what we actually gave away so that we have information moving forward. We decided to just make handouts for the Spanish translations instead of packets with Spanish labels. So when someone needed one in Spanish, we just taped on a Spanish label on top of the English label. We did not get the Farsi/Dari translation done this first year. ​It takes time to pack seeds, but with some planning it can be fun and efficient. Have a packing party and take a few steps ahead of time to best utilize your volunteers. 1. Decide on how many seeds go into each packet. 20 is a good number. 2. Figure out a measuring tool that can quickly approximate the number of seeds you are giving. For example, the Painted Pony was a fairly small bean and 20 beans fit in a tablespoon. So count out the number of peas or beans and try a few different measuring tools, such as measuring cups. You may want to take a marker and put a line on the container to approximate how many 20 would be. Have several sets of these pre-marked before the packing party. 3. Have your envelopes printed. Here's an example of the Care to Share (20 beans) packet. It's not much space to communicate a lot of information. This is one reason we encourage you to get emails from people. Additional information will be shared via email. If you are doing several levels of packets: Care to Seed Share, Grow a Row, & Bed of Beans or Plot of Peas, consider printing these on different colored paper. It is a lot of work to attach labels. Everyone is going to have their system, but you may want to have a quick discussion to see what folks thing will be fastest. 4 dots of glue in each corner is usually sufficient to attach an envelope. Preparing for the packing party. 2. Have some packets available at your seed library with a special display and sign up sheet. You can have them see a librarian or have them self-check out. 3. 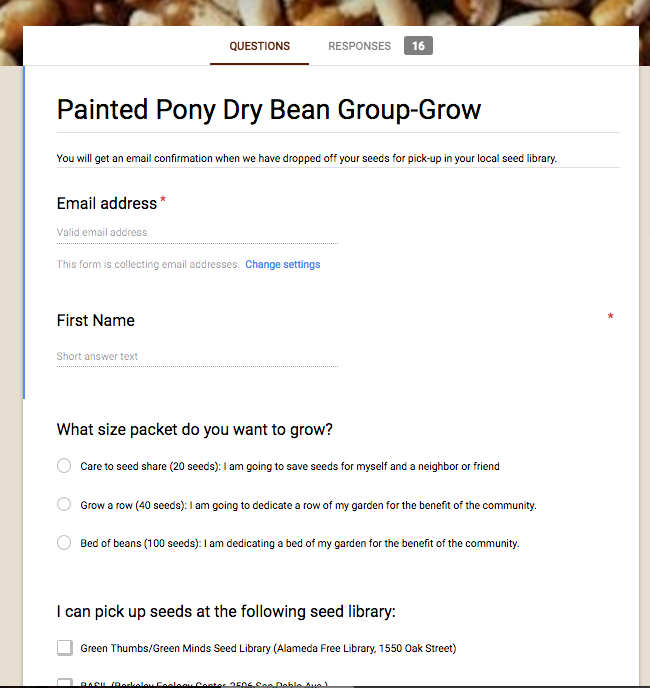 Create an electronic sign-up form and explain how folks can collect their seeds. We just explained in our form, that they need to go to their local seed library (we listed all of the names and addresses) and said to pick them up there. These can be shared out via social media and allows you to reach a larger audience. 4. Create a spreadsheet of people who have larger plots, such as urban ag folks, colleges horticulture departments, school gardens, and see if any of them would be able to do a "Bed of Beans" or a "Plot of Peas" for the community. 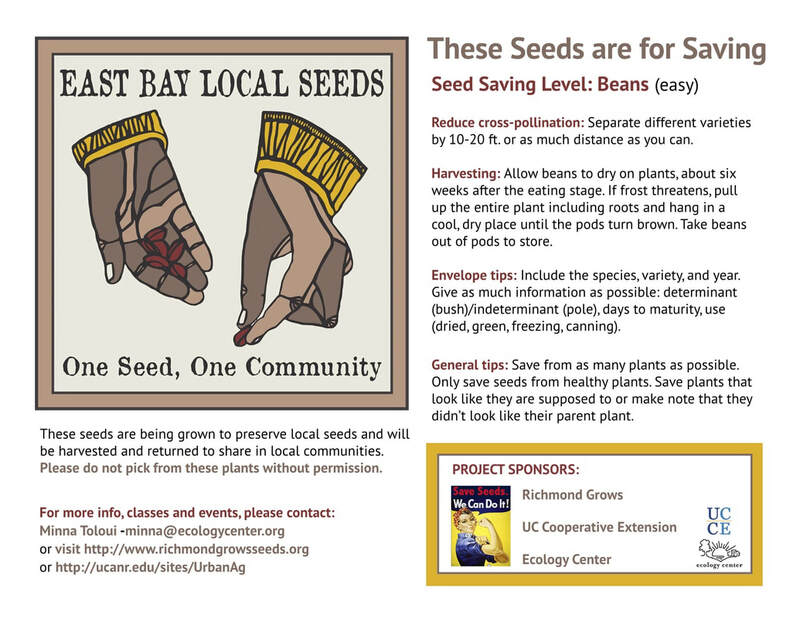 You can also create signs that larger growers can post to educate the community about seed saving and the One Seed, One Community program. One library made this sign for patrons informing them of the One Seed, One Community program. Here is a sample of a Google form that was shared on social media to increase participation. The above garden sign was made available to people who had a public garden to increase awareness of seed saving and the One Seed, One Community program. You will need to determine the best planting times for the crops you are growing in your area. Here are several basic emails you can tweak to get you started. A BIG thanks to Hillie Salol who wrote the following emails and put the basic template for this program together! 3. Third email - Reminder to plant and also information about upcoming seed classes; it's helpful to have a class planned during the One Seed, One Community program for folks who feel like they want a bit more support and for those who want to learn how to save other crops too. Here is seed saving class presentation. Feel free to use it or adapt it. Find a time to celebrate! Silicon Valley Grows did their Great Bean Weigh Off party on​ World Foods Day, October 16. Some other suggestions are having a seed swap / Great Bean Weigh Off. This would encourage more folks to show up and you can also have the next One Seed, One Community program selection to give away. Another idea is to see if there are any harvest festivals that you can be a part of and add the Great Bean Weigh Off to the celebration. A huge thanks to Hillie Salol for creating the One Seed, One Community program! If your community does a One Seed, One Community program and you have suggestions on how to improve any of the resources or create additional ones, please let us know.